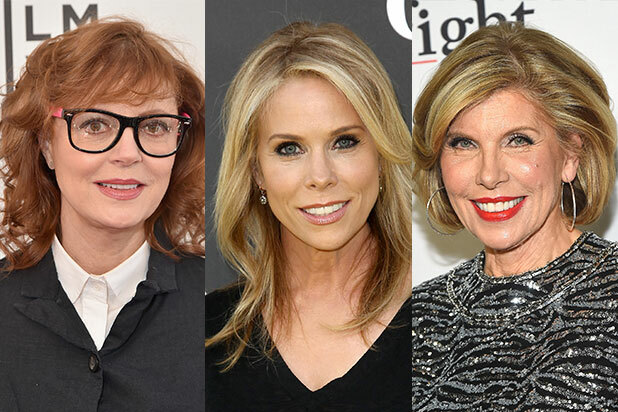 Susan Sarandon, Cheryl Hines and Christine Baranski have joined the cast of STXfilms’ “A Bad Moms Christmas,” the production company announced Tuesday. Returning as the stars of the film are Mila Kunis as Amy, Kristen Bell as Kiki and Kathryn Hahn as Carla. Hines will play Kiki’s mom, Baranski will play Amy’s mom and Sarandon will star as Carla’s mom. Production has begun on “A Bad Moms Christmas,” written and directed by Jon Lucas and Scott Moore and produced by Suzanne Todd. Bill Block and Mark Kamine are serving as executive producers. Also joining the cast are Peter Gallagher and Justin Hartley. Returning cast members include Jay Hernandez, David Walton and Wanda Sykes. “A Bad Moms Christmas” will follow the group of foul-mouthed ladies as they deal with their own mothers visiting for the holidays. “Jon and Scott’s hilarious premise for ‘A Bad Moms Christmas’ will not only let fans continue their laugh out loud love affair with Mila, Kristen, and Kathryn’s relatable antics, but adding Peter, Justin, Cheryl, Christine and Susan, and the holidays to the equation is more than we could have hoped for as we continue this important franchise for STX Entertainment,” said Adam Fogelson, chairman of STXfilms, in a statement. “Bad Moms” made $113 million at the domestic box office and $179 million worldwide after its July 29, 2016 release. STX has already set a “Bad Dads” spin-off, set to hit theaters on July 14, 2017. “A Bad Moms Christmas” will be released on Nov. 3, 2017. Mila Kunis has grown up since her days as a child star when she was portraying a young Angelina Jolie in "Gia." Since then, she's had dramatic and comedic turns as an actress and model. Her latest film "The Spy Who Dumped Me" opens August 3. At age 10, Ukraine-born Mila Kunis landed a small role in the 1995 short movie "Make a Wish, Molly" about a Russian Jewish girl newly arrived in the U.S.
Kunis also played small parts in mid-'90s TV shows like "Baywatch." She had a recurring role as Ashley in the WB family series "7th Heaven" between 1996 and '97. Kunis played the 11-year-old version of Angelina Jolie's character in the acclaimed 1998 HBO movie "Gia," a biopic of '70s model Gia Carangi that won Jolie and Faye Dunaway Golden Globes. At 14, she fibbed about her age and landed her breakout role as the spoiled rich girl Jackie Burkhart in the hit Fox sitcom "That '70s Show," opposite Ashton Kutcher as dim-witted Michael Kelso. In 1999, Kunis replaced Lacey Chabert as the voice of awkward teenager Meg Griffin on Seth MacFarlane's animated sitcom "Family Guy." Mila Kunis tried to make a leap to the big screen opposite Kirsten Dunst in the 2001 high school rom-com "Get Over It." In 2002, Kunis began dating former "Home Alone" star Macaulay Culkin (seen here at a 2005 benefit for victims of Hurricane Katrina and Hurricane Rita). The couple officially announced their split in 2011. Kunis proved a romantic charmer as a Hawaiian resort worker who connects with Jason Segel's recently dumped hero in the 2008 rom-com "Forgetting Sarah Marshall." In 2009, Kunis popped up at Spike's Guys Choice Awards to claim the award for "Hottest Mila" (besting Mila Jovovich for the honor). In 2010, she tried her hand at action in the Denzel Washington postapocalyptic thriller "The Book of Eli." Mila Kunis had a high-profile and widely acclaimed role opposite Natalie Portman as an ambitious ballet dancer in Darren Aronofsky's drama "Black Swan," earning a Golden Globe nomination for Best Supporting Actress. Kunis got frisky with Justin Timberlake in the 2011 R-rated comedy "Friends With Benefits." Kunis re-teamed with "Family Guy" creator Seth MacFarlane in 2012 on his feature directorial debut, "Ted," playing the long-suffering girlfriend of Mark Wahlberg, a guy who's unduly influenced by his foul-mouthed teddy bear. For 2013's "Oz the Great and Powerful," a prequel to one of the actress' favorite movies as a child, Kunis endured hours of makeup to play a younger version of Theodora, the Wicked Witch of the West. Kunis has won many fans for her looks and was named "Sexiest Woman in the World" by FHM in 2013. She has also not been shy about showing off her body, as she did during the FHM photo shoot. Kunis headed back into action territory in the 2015 sci-fi epic (and box office dud) "Jupiter Ascending" opposite an oddly blond Channing Tatum. Kunis married her former "That '70s Show" co-star Ashton Kutcher in July 2015, months after she gave birth to their daughter, Wyatt. Here, they're seen promoting NBC's Red Nose Day charity telecast in May 2016. In 2016, she re-teamed with her "Forgetting Sarah Marshall" co-star Kristen Bell -- as well as Kathryn Hahn -- in the R-rated suburban comedy "Bad Moms." In her latest role, Kunis teamed with "SNL" star Kate McKinnon for the action-comedy "The Spy Who Dumped Me," about a woman who discovers her ex-boyfriend is a spy entangled in an international conspiracy. ‘Bad Moms’ Mixed Reviews: Do Female-Led Comedies Get a Bum Rap?